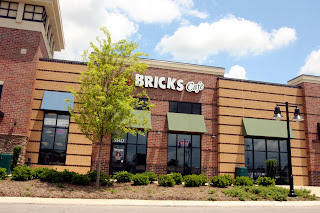 Brick's Cafe is one of the relatively newer joints in town, opened in 2003 in its Franklin (Fieldstone Farms) spot. The locally owned and operated restaurant now has three locations across town, taking a spot in the recently renovated Brentwood Place Shopping Center (next to Five Guys) and taking over the space formerly occupied by Uncle Gio's Pizza (R.I.P.) on Nolensville Road in the South Nashville Cane Ridge area. A friend of mine has been recommending Brick's for a few weeks now and she was kind enough to join me at the Brentwood location to split a pepperoni and cheese pizza for this week's installment of Friday Night Slice. Side note about aforementioned friend: She used to be a vegetarian. She is currently married to a butcher / meat manager. *Used to* be a vegetarian. Brick's touts itself as a causal restaurant that specializes in brick oven pizzas. Unlike other places I've visited, there was no denying the authenticity here as a huge, open face, fiery brick oven overlooks the dining room. The place was much jazzier than I was expecting with skinny beverage glasses and swanky black linens, and the menu was far more expansive than I had anticipated as well. Brick's offers soups, salads, sandwiches and pastas along with a large, inventive pizza menu including a Crawfish and Hot Sausage pie. Our pepperoni and cheese pizza arrived piping hot. Steam escaped as we removed the first triangular-cut slice to reveal a heavy, high pull-away factor cheese that was immediately promising. The cheese and the sauce equally vie for attention in the first bite as both are unique and delicious. The sauce is thick and sweet with small tomato chunks and fresh spices that step out of the standard Italian comfort zone. The cheese is a tangy mozzarella with a smoked provolone that is thick, smooth and absolutely amazing. The crust was distinct and surprising as well - a thin crust with a soft, flexible base, fluffy interior and cracker-crisp outside edge. 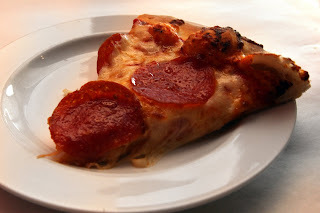 The pepperoni was rather mild, but fresh, tasty and a perfect complement to the sauce. Everything about Brick's was a pleasant, welcome surprise. 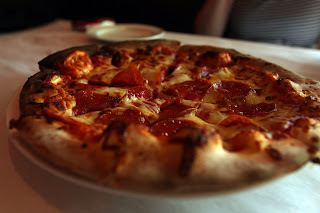 We've all had the ho hum wood fired pizzas in "regular restaurants" where chefs attempt to cover a multitude of sins with a heavy sprinkling of random spices (I'm pointing to you, Bosco's), but Brick's appropriately marries unique flavors and offers a great pizza that is different than what you'll find in most places around middle Tennessee. I'll definitely be back to explore the menu more. Thanks, Rachel! Friday Night Slice, Part 13: Nashville Pizza Co.
Got any suggestions for places that I should cover? Let me know! Thanks for letting me in on Friday Night Slice!! As a fellow pizza lover I had a blast!